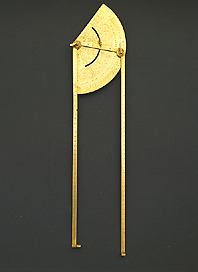 This distance-measuring instrument is based on a circular sector of about 130?, the radius of which is 9 cm. A fixed ruler, divided into 44 parts, runs from the centre along one edge, and there is a short moveable arm at the end of which a second ruler, also divided into 44 parts, is pivoted. Each ruler is provided with two sights. On the back are three small brass tubes, perhaps intended to allow the instrument to be placed on a stand. Distance was presumably measured between two stations, the distance of which was proportional to the length of the mobile arm. In this way the rulers formed a triangle proportional to that having one side equal to the unknown distance. The manner in which the instrument is constructed and the elaborate engravings suggest the attribution of the instrument to Baldassarre Lanci, from Urbino.